I was losing my health insurance benefits, so she decided to have one last physical. Randy Pierson grew up in Old Town, and currently lives there with her 2 boys. She was diagnosed with breast cancer 4 years ago, during a time of change in her life. Randy had been married for 19 years when her husband (whom had been living out of state for 6 years) asked for a divorce. Randy was concerned about losing her health insurance benefits, so she decided to have a physical. She had not seen a primary care doctor for about 5 years, due to her doctor moving away. At the time of the physical, the doctor found a lump in her throat. Within one week, Randy had seen a specialist for a biopsy, found out she had cancer, and had it. Three weeks later, she had a mammogram which discovered a mass that had grown since a previous mammogram, on the bottom of her right breast. She then had a biopsy which determined she had breast cancer. Randy had 3 lymph nodes removed (with all 3 being negative) and one week later had a double mastectomy. She also had reconstructive surgery the same day as her double mastectomy. Randy feels that even though the break-up of her marriage was really challenging, she may not have found out about both of her cancers if she had not had to get a physical due to potential loss of her health insurance benefits. Due to her need for cancer treatments, she was able to keep her health insurance benefits until after her treatments were done, which meant that she was beyond the 20-year point of being married to her husband and she was able to keep her military insurance benefits for life. 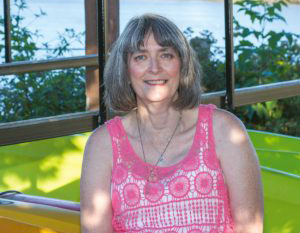 During all these medical treatments, Randy felt like she wanted to be able to talk about her experiences, but she did not know of anyone else that had experienced breast cancer who she could talk to face to face. She had heard about the support group which Caring Connections hosts, and after 1 ½ years she was able to start attending the Caring Connections support group. She really enjoys being able to talk to other about their experiences with breast cancer. Randy feels that her experience with breast cancer and thyroid cancer has made her stronger. She expresses herself more and can now talk in front of groups about her experiences, has done the zip-line at the annual Caring Connections Breast Cancer Survivor Retreat, as well as being a model for Pink Runway. All things she never thought she would do. Randy is grateful for the opportunity to participate in the Pink Runway Project, having fun posing for pictures and having her hair and make-up done. The day of the event is also her mother’s birthday, which makes it an extra-special day for her.